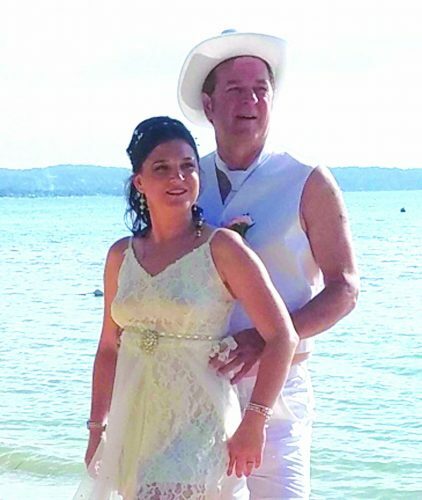 Leanne Shed, of Buffalo, was married to Brian Regan, formerly of Gowanda and now of Amherst, in ceremonies conducted July 25, 2015. The ceremony was conducted at St. Louis Church, Buffalo and officiated by the Rev. Daniel Walsh of Holy Trinity Church, Dunkirk. Leanne is the daughter of Mrs. Roseann Marchenese of Parrish, Fla. Brian is the son of Mr. and Mrs. Kevin Regan of Gowanda. Maid of Honor was friend of the bride, Fawn Dorr. Bridesmaids were: Kathleen Jones, sister of the groom; Michelle Regan, sister of the groom; Rebecca Priebe, cousin of the bride; Michelle Manfredo, friend of the bride; Alex Brewer, friend of the bride and Nichole Kicinski, friend of the bride. Best man was Matt Howard, friend of the groom. Ushers were: Steve Jones, brother-in-law of the groom; Matt Pesesky, friend of the groom; Bradley Shed, brother of the bride; Scott Glanville, friend of the groom, and Steve Burr, friend of the groom. Luke Jones, nephew of the groom served as ring bearer. The bride is a graduate of Clarence Central, Brockport State College and will graduate from D’Youville College in May 2016. She is employed as a nurse’s aide at Roswell Park Cancer Institute. The groom is a graduate of Gowanda High School and a graduate of St. Bonaventure University: BBA and MBA. He is a certified public accountant employed at Citi Bank. Kelly Marie Coniglio of Crofton, Md., formerly of Fredonia, and Andrew George Martin of Odenton, Md. were united in marriage in a double ring ceremony held at Saints Peter and Paul Catholic Church in Williamsville on Oct. 24, 2015 at 2 p.m. The ceremony was performed by the Rev. Sebastian C. Pierro of St. Gregory the Great Roman Catholic Church in Williamsville, long time friend of the bride. The bride is the daughter of Leonard and Roberta Coniglio of Fredonia. The groom is the son of Dennis and Carol Martin of Bowie, Md. The bride was escorted by her father. Wedding musicians were organist Don Fellows of Pittsburgh, Pa., soloist Tara Amidon of Dunkirk and trumpeter Donald Keddie of Fredonia. Readers included friends of the bride Sarah Krzal, Rock Vallone and Lindsey Clark. Gift bearers included Bonnie Blechl, godmother of the bride, Diane Franklin, aunt of the bride and Karen Kiefer, aunt of the groom. The bride wore a charmeuse trumpet gown with ruched sweetheart bodice with pick-up skirt adorned with a beaded accent belt. Hand-tied with her grandmother’s handkerchief, her bouquet consisted of hot pink gerber daisies, calla lillies and spray roses with green hypericum and a touch of purple statice. Her bouquet carried two small picture charms of her late grandmother Lucille Coniglio and late aunt Linda Coniglio. Jamie Coniglio of Crofton, sister of the bride, served as maid of honor. Nicole Kozar of Woodbridge, Va., friend of the bride, served as matron of honor. Bridesmaids included Danielle Sculley and Ashley Franklin, both of Erie, Pa., cousins of the bride; Kristen Kuzma of Columbia, Md.., friend of the bride and Michelle Stevens of Denver, Colo., friend of the bride. Kellen Ruhl of Odenton, friend of the groom, served as best man. Ushers included Richard Kiefer and John Kiefer of Franklin Square, N.Y., both cousins of the groom and Charles Contois of Crofton, friend of the groom. A reception followed at Samuel’s Grande Manor in Williamsville. The bride earned a bachelor of science degree from SUNY Geneseo in 2007 and a masters of science degree from the University of District of Columbia in 2015. She is employed as a speech language pathologist in Anne Arundel Public Schools. The groom earned a bachelor of arts degree from Catholic University of America in 2007 and a master’s of science degree from the University of Maryland in 2015. They are at home in Odenton. 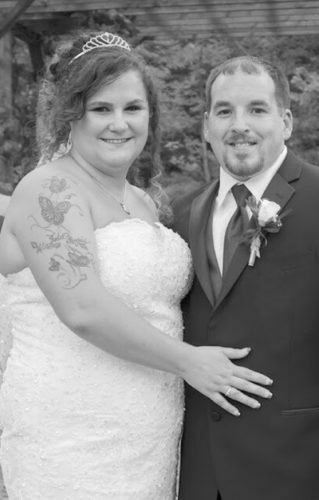 Kimberly Ann Conti and James Daniel Muscato were united in marriage on August 15, 2015 at The 1891 Fredonia Opera House. The double ring ceremony was officiated by Mary Jo Bauer. A reading was given by Michelle Conti, sister of the bride. The bride is the daughter of Mr. and Mrs. Fiore (Cynthia) Conti Jr. of Fredonia and granddaughter of Mary Conti of Fredonia. The groom is the son of Mr. and Mrs. Philip (Betty) Muscato and grandson of Mabel Muscato and Dee Glover, all of Cassadaga. The bride, escorted by her father, wore an ivory lace and silk organza strapless gown with a corset back. The dress had an embroidered lace bodice and scattered beading, with a main focus of bead work in the center decor, paired with vertical ruffle skirts with hints of embroidered lace throughout. She carried a bouquet of ivory roses and wore her grandmother’s wedding band. The Matron of Honor was Renee Raineri of Lancaster, sister of the bride. Bridesmaids were Michelle Conti of Dunkirk, sister of the bride, Tracey Conti of Orchard Park, sister of the bride, Jess Henry of Buffalo, cousin of the bride, Misty Graham of Sherwood, Ohio, sister of the groom, Alexandra Peterson of Jamestown, friend of the bride, and Rebecca Zimmerman of Jamestown, friend of the bride. They wore Jasmine Belsoie tiffany chiffon gowns in berry with a V neckline, A-line skirt, a sash detail, and lace on the bodice. They carried bouquets of ivory roses and hydrangeas. The flower girls were Mackenzie, daughter of the groom, and Isabella and Kenedee, nieces of the bride. They wore ivory gowns inspired by Disney’s Princess Jasmine by Alfred Angelo. The dresses featured shimmering organza, accented with an asymmetric ruffle tiered skirt. Timothy Cobb Jr. of Cassadaga, friend of the groom, served as the best man. Groomsmen were Thomas Delcamp of Westfield, friend of the groom, Nathan Baideme of Westfield, friend of the groom, Nicholas Sobecki Jr. of Westfield, friend of the groom, Anthony Graham of Sherwood, Ohio, brother in-law of the groom, Vincent Conti of Fredonia, brother of the bride, and Andrew Conti of Fredonia, brother of the bride. The ring bearers included Mason, son of the groom, Mason and Nicholas, cousins of the bride, and honorary ring bearer, Benjamin, nephew of the bride. A reception followed at the Blessed Mary Angela Parish Hall and was catered by The Liberty Food & Spirits of Fredonia. The bride is a graduate of Fredonia High School and SUNY Fredonia. The groom is a graduate of Cassadaga Valley High School and Jamestown Community College. The bride and groom are both employed by the Chautauqua County Sheriff’s Office. The groom is also a member of the County Fire Investigation and Forensic Investigation Teams. 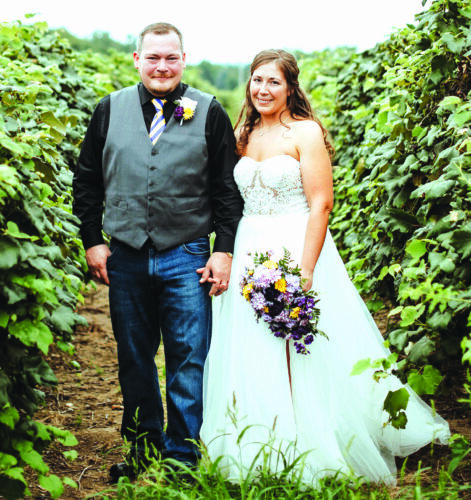 Allison Leigh Dole and Nathan Anthony Ingrao exchanged wedding vows on June 20, 2015, at Bethel Lutheran Church in Jamestown. The Rev. Alan Anderson performed the ceremony. Music was provided by Brett Muscarella (organist), Brianne Ingrao (violin), Lauren Ingrao (violin), and Gavin Ingrao (Cello). Todd McNeil was the reader. The bride is the daughter of Charles and Sandra Dole of Jamestown. Her husband is the son of Stacey Chase of Jamestown and Richard Ingrao of St. Augustine, Fla.
Brittany Kilbury, friend, and Jamie Cercone, sister of the bride, were matrons of honor. Bridesmaids were Joanna Olson, Ashley Dupler, friends of bride, Amber Lombardo, and Hannah Lombardo, both cousins of the bride. Briar Cercone, the bride’s niece was the flower girl. Nicholas Ingrao, brother of groom, was the best man. Groomsmen were Matthew Ingrao, brother to groom, Christopher Dole, bride’s brother, David Cercone, brother-in-law, Justin Bloyd, Jonathan McNulty, Brian Chase, Trevor Franklin, all friends of the groom. Kane Cercone, nephew of the bride, was the ring bearer. Masters and Mistress of the ceremonies were Brett, Chad and Ashley Muscarella, all cousins of the groom. The bride is a graduate of Jamestown High School, Jamestown Community College and SUNY Fredonia. She is currently employed by Putnam County Schools as a high school science teacher. Her husband is a Jamestown High School and SUNY Fredonia graduate. He is currently employed with Accordia Global Compliance Group as an account manager. They honeymooned in Punta Cana, Dominican Republic following the wedding. The two are currently living in St. Augustine with their dog Tucker. Ashley Elizabeth Crandall and Kade Pittman were united in marriage in a double ring ceremony on Sept. 12, 2015 at 6 p.m. at the Chateau Eza in Eze, France. The bride is the daughter of Clinton Crandall of Sugar Grove, Pa. and Lisa Crandall of Dunkirk. The honorary flower girl was Elle Kate Lumley, niece of the groom. The bride is a 2005 graduate of Cassadaga Valley School. She is an occupational therapist. The groom is the Director of Real Estate of Movie Tavern Inc. The couple is at home in Dallas, Texas. Meredith Elizabeth Savina Hicks of Dewittville and Robert Fredrick Morris of Lancaster exchanged marriage vows on Sept. 26, 2015, on the grounds of The Chautauqua Institution in The Hall of Philosophy, before Chaplain Maureen Rovegno, M.Div. Music was provided by guitarist Jamey Kerns of Buffalo and vocalist Morgan McChesney of Mayville. Kathryn Phillips of Buffalo was the maid of honor. Best man was cousin of the groom, Andrew Holmes. J. Garrett Hicks, brother of the bride, was the groomsman. Chantilly lace accented the diamond white organza ball gown and chapel length train worn by the bride. Her fingertip mantilla was accented with embroidered lace. She carried a bouquet fashioned from three varieties of eucalyptus, mums, locally found greens, protea and spray roses, created by Little Sweet Pea Floral Design. A reception was held following the ceremony at the Athenaeum Hotel in Chautauqua Institution, featuring music by the seven-piece rock and roll band, Usual Suspects. The bride is the daughter of Daniel Hicks and Joan Savino Hicks of Point Chautauqua. 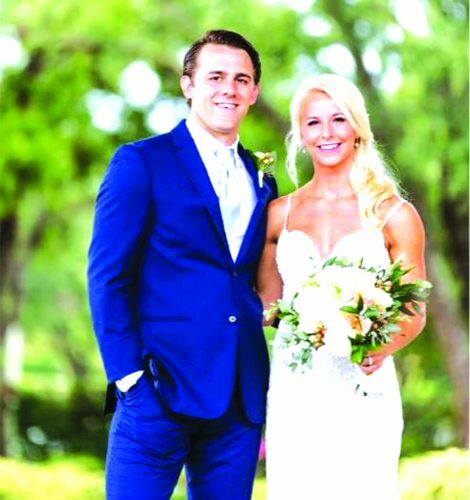 The groom is the son of Fred (Jane) Morris of Summerfield, Fla. and Cheryl (Cameron) Lane of Lake View. The bride teaches physical education for the Buffalo Public Schools. She holds bachelor’s and master’s degrees in physical education from SUNY Brockport and is a graduate of Chautauqua Lake Central School. The groom works for the Department of Homeland Security and is an MBA candidate at Medaille College. He also holds a bachelor’s and master’s degree from Canisius College. He is a US Army Veteran and is a graduate of Lancaster High School. The couple honeymooned in Colonial Beach, Va. They are currently living in Alden, N.Y.